Congratulations to Sean and Erica Elderton! What a fantastic wedding in a fantastic setting. Erica was a beautiful bride and the gown was just fabulous. There are just too many great shots. Sean & Erica’s Ceremony was held March 27th at the Pioneer United Methodist Church which is the oldest church in Placer County. 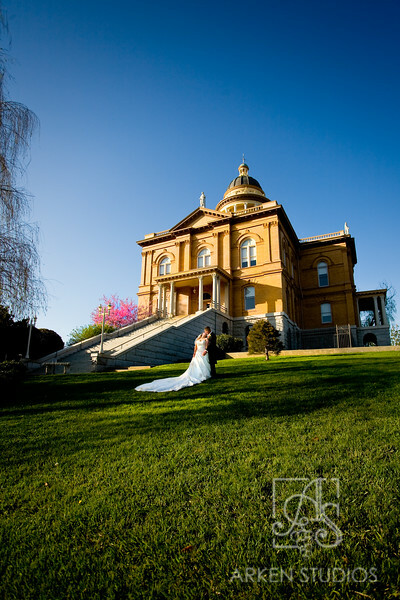 After the Ceremony we had the entire Bridal party walk across the street to create images at the beautiful Court House. We had a great time shooting the after ceremony shots as you can tell. The weather couldn’t have been more perfect as I sit here in our Sebastopol office of Arken Studios this weekend with the rain coming down non-stop. Scott – I believe we are thinking of the same Sean Elderton. Did you manage to get in touch with him? email me if possible, my whole name with no caps or spaces, gmail. thanks!